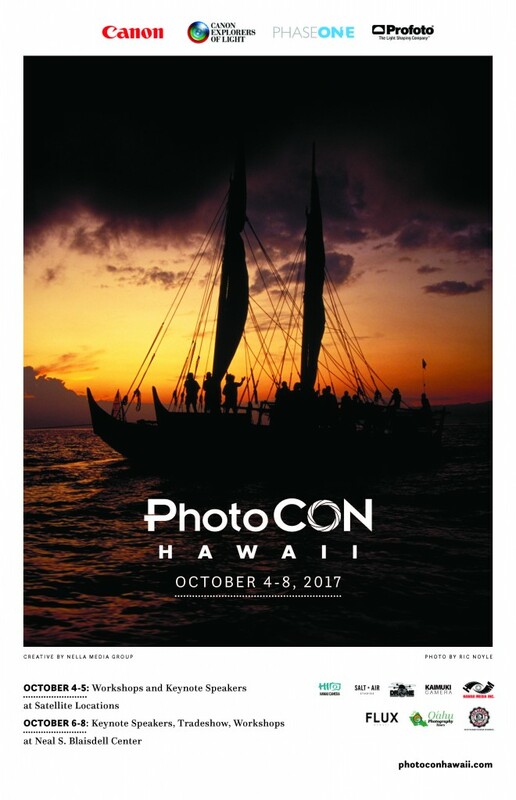 (Honolulu, HI)— PhotoCon Hawaii, short for Photography Convention, is already shaping up to be a big buzzworthy event with many industry insiders ready to engage with the local photography community. There will be workshops and KeyNote speakers throughout the first week of October at various locations along with a two-day trade show on October 7–8, 2017, at the Neil S. Blaisdell Center. Exhibits will include new product and service introductions and demonstrations, workshop seminars and the award ceremony for The Essence of Hawai`i Photo Contest. Canon USA will also conduct photography classes in Photo 101 and Photo 102 classes for all levels held twice a day over the trade show weekend. Attendees are invited to connect with commercial and amateur photographers, videographers, prosumers (photo enthusiasts who buy professional-grade equipment), university and high school students, wedding photographers and niche market image-makers. An Early Bird Registration rate of $10 per day or, $15 for both days is available until Friday, July 21, 2017. Online registration will guarantee access to all KeyNote presentations and the Tradeshow. For those interested, register online at photoconhawaii.com/registration/. First, Second and Third place winners will receive prizes from Canon USA, Phase One and Profoto. Winning images and runners-up along with a photographer bio and caption will be printed in the official PhotoCon Journal as well as in the Fall issue of FLUX Magazine (on newsstands from September through December 20, 2017). Winners are to be determined by a select group of industry experts through predetermined criteria. Images shot in Hawai`i during 2016, and 2017 are eligible for entry. Contest entries close on July 7, 2017. Ric Noyle will announce The Essence of Hawai`i Photo Contest winners on October 7, 2017. For more detail, visit photoconhawaii.com/call-for-entries/.